Aspirus Riverview Hospital in Wisconsin Rapids invites everyone to the grand opening of the new Aspirus Riverview Family Birthplace on Thursday, January 31. The celebration will include self-guided tours and light refreshments from 4 to 6 pm and a ribbon cutting ceremony at 5 pm. The new birthplace features 425-square-foot hotel-style suites with walk-in showers, whirlpool tubs, large flat-screen TVs, queen-size sofa beds, in-suite mini fridges, dimmable lights, and more to make the wonder of birth even more wonderful. Rooms and hallways within the new birthplace feature beautiful and soothing nature themes from around Wisconsin. The most convenient parking for those attending the grand opening celebration will be in Lot 4 – on the north side of Dewey Street across from the hospital. The new birthplace is located on the third floor of Aspirus Riverview Tower on the west end of the hospital campus. The first day it will be open for newborn deliveries will be February 14. Until then, the current Aspirus Riverview Family Birthplace will continue to be open. Aspirus Riverview Hospital & Clinics is a non-profit, community-directed health care organization based in Wisconsin Rapids. It includes Aspirus Riverview Hospital, Aspirus Doctors Clinic & Walk-In Care, Aspirus Riverview Clinics in Wisconsin Rapids, Nekoosa, Rome and Adams, Aspirus Heart & Vascular, Aspirus UW Cancer Center, Aspirus Riverview Wound & Hyperbarics, Aspirus Riverview Joint Center, Aspirus Riverview Therapies and Aspirus Riverview Dental. Aspirus Riverview Hospital is one of the top 100 community and rural hospitals in the country, and Aspirus was recently named one of the top 15 health care systems in the nation. Aspirus Riverview Hospital & Clinics continues to grow and add services in the communities it serves. In addition to the new birthplace, Aspirus Riverview is nearing completion of a new state-of-the-art emergency department (opening in March) and opened, on January 14, 2019, the brand new Aspirus Riverview Clinic - Adams. In 2018, Aspirus Riverview Clinic in Wisconsin Rapids added behavioral health services to help meet the area’s growing need for mental health and substance abuse services. 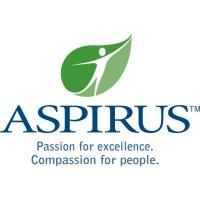 To learn more about Aspirus, visit aspirus.org or call 800.847.4707.